The lotus embodies the passing of the years. It blossoms layer by layer and peels off layer by layer. There is a whisper between the lotus and me and a consensus is reached: "My life can only be wholly expressed through my works!" The relationship between the lotus and Buddhism serves as a symbol representing everlasting energy. This constantly changing relationship has had a profound impact on my imagination. There is wisdom and power hidden beneath the beauty of the lotus. In Chinese philosophy there are five phases of matter and energy: metal, wood, water, fire, and earth. There is no life or death, only the transformation of matter through space and time. Energy gathers to form the lotus, the human, and other types of matter. This energy is eventually scattered throughout every aspect of reality: into the dust, the air, the temperature, the humidity, and the soul, in a perpetual cycle. Shape, color, and smell are temporary aspects of the universe. The lotus flower, the leaves, the stalks, the seeds,and the roots are eventually scattered into dust, leaving only their fragrance behind. In my artworks the omnipresent lotus is born into a boundless existence. Having never belonged to one place, the lotus is free and reaches throughout every part of reality. The lotus has touched my heart, and through my works I have striven to express the true essence of the flower. 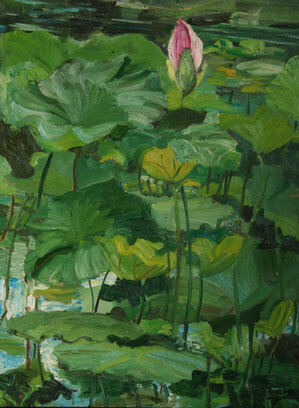 My lotus paintings have also been increasingly enriched with my own emotions.